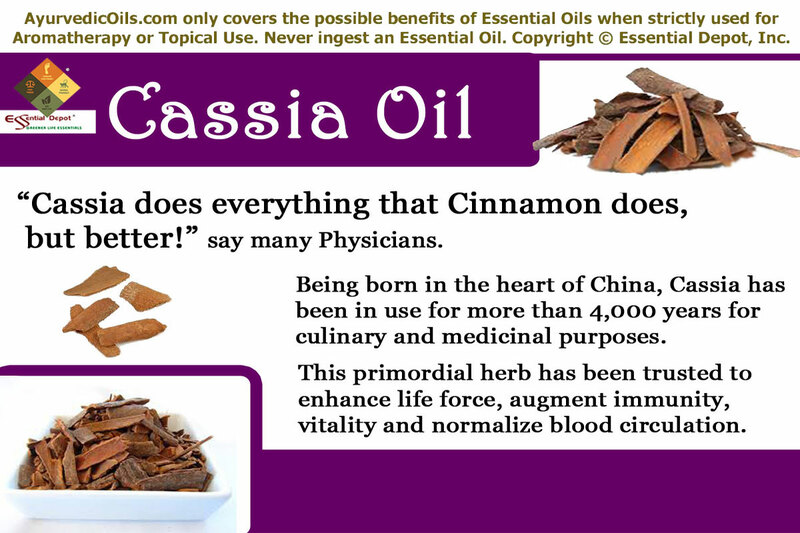 “Cassia does everything Cinnamon does, but better!” say many Doctors. Cassia owns the glory of being born in the heart of China and has been in use for more than 4,000 years for culinary and medicinal purposes. This ancient herb has been trusted to enhance energy, life force, vitality and blood circulation. Cinnamomum cassia, also known as Chinese cinnamon or Chinese cassia finds its origin in South China. This tree serves several purposes and is hence widely cultivated in India, Indonesia, Laos, Malaysia, Taiwan, Thailand and Vietnam. With its celebrated use in the Traditional Chinese Medicine, Cassia is regarded as one among the 50 fundamental herbs of China. Cassia finds its importance in the United States too, and is marketed under the name of “Cinnamon” for culinary purposes. The Indians take a liking to the buds on the tree as well and also use it in their food; this is an ancient ingredient for soul food used by the Romans as well. This tree grows to a height of 10–15 m, which has a grayish bark with leaves that are hard and elongated and a warping of 10-15 cms in length with a pretty red color when young. The bark of the tree finds its uses in the kitchen, while the leaves and the twigs of this tree are sometimes used in the production of Cassia oil. The oil extracted from the Cassia tree, finds immense importance in the field of Complementary and Alternative medicine including Ayurveda. It is useful as a medicine, for beauty care, for cooking, as a health tonic and also as a stimulant. Cassia oil is brownish to yellowish in color, and the refined oil is colorless with a pale yellow tint when held up to the sunlight. The aromatic bark of Cassia has been in use as a medicinal spice in various traditions across the world. In traditional Chinese medicine, Cassia cinnamon has been used for treating diarrhea, cold, nausea, painful menstruation and flatulence. It was also used to boost immunity, treat fever, rheumatoid arthritis, kidney infections, candida, nail fungus, atherosclerosis, cataract and even cancer, with its natural antioxidant properties. According to the Gas chromatography report, Cassia oil constitutes of 12 chemical components that contribute to its fragrance, therapeutic attributes, consistency and quality of this super aromatic oil. Of which, (E)-Cinnamaldehyde contributes to the highest proportion of Cassia oil constituents with about 81.3% of its total composition. 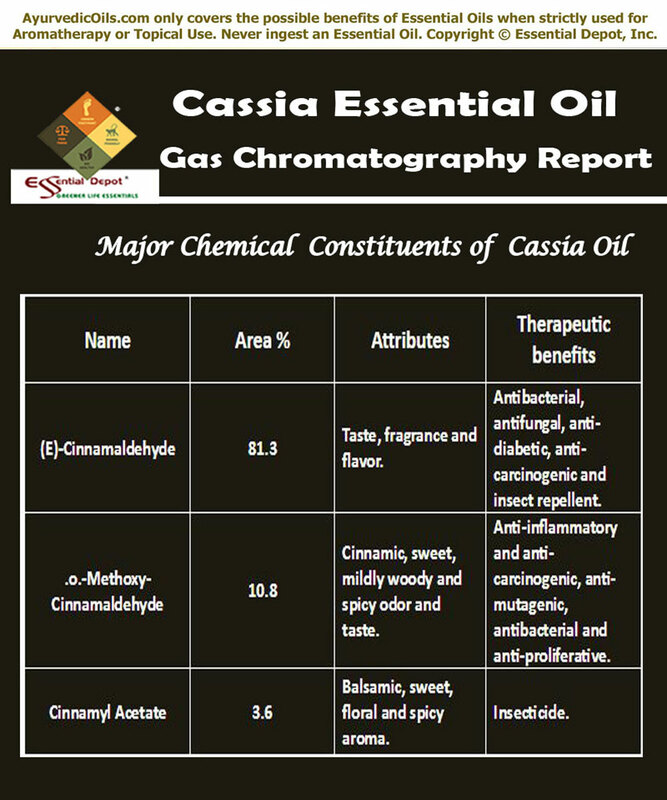 I believe that this must surely help you in learning about the major chemical constituents of Cassia oil. The table crafted below clearly depicts the unique nature and contributions of these biochemical constituents to the healing brilliance of Cassia essential oil. The remedial properties of Cassia oil are fungicidal, antimutagen, stimulant, anticoagulant, antiviral, antibacterial, circulatory, anti-diarrhea, anti-arthritic, antioxidant, carminative, anti-galactogogue, anti-rheumatic, emmenagogue, anti-depressant, febrifuge, anti-diabetic, anti-inflammatory, antimicrobial and anti-emetic. Ayurveda is a righteous remedial practice that indicates that everything on earth should follow a disciplined order of living for leading a healthy and progressive life. Every human being is a part of nature according to Ayurveda and one’s illness and wellness depends upon an individual’s balance with nature. Ayurvedic healing trusts and depends upon Mother Nature and its natural remedies for treating humanity. This 5,000 year oldest healing methodology is the pioneer for all other medicinal practices including Homeopathy, Siddha, Unani, Chiropractic, Acupressure, Allopathy, the Traditional Chinese Medicine and much more. The first Ayurvedic record refers to Atharvaveda, one of the 4 sacred books of the Indian mythology with 114 verses talking about numerous diseases and the corresponding traditional remedies of Ayurveda. This was further enhanced by the 3 most important Ayurvedic encyclopedias namely Charaka Samhita (Charaka – the father of medicine), Sushruta Samhita (Sushruta – the father of surgery) and Ashtanga Hridaya Samhita. These books have talked on all the fundamental principles of Ayurveda, various kinds of illnesses and their comprehensive medicinal practices. This includes Ayurvedic remedies for almost all kinds of diseases including the chronic cancer. The distinctiveness of Ayurveda lies in its holistic approach that treats the root cause of an illness instead of its symptoms. This paves way for treating the sickness as well as preventing it in future. Instead of prescribing the same medicines for everyone, Ayurveda recommends unique remedies for every individual according to their unique individual constitution, even if it is for the same illness. This is because Ayurveda identifies every individual as a distinctive part of nature and considers that their illnesses should also be treated with accordance to it. The unique individual constitution or prakriti is an arrangement of three biological energies called as doshas, namely vata, pitta and kapha. These doshas are a combination of the five elements of nature including fire, earth, space, air and water. Vata (air and space) controls the functions of the nervous system, circulatory system and the respiratory system. Pitta (fire and water) governs the metabolic functions and body temperature. Kapha (earth and water) is in charge for the movement of fluids in the system and the functions of the reproductive system. Every person has a dominance of any one these doshas and it determines the physical appearance, personality, behavioral patterns and mental makeup. Absolute balance between these doshic elements symbolizes healthiness and disparities of these biological factors lead to diseases. Ayurveda prescribes natural remedies like plant essential oils, herbs, meditation, yoga, simple physical exercises, Pranayama, Ayurvedic routine, prayers and certain Ayurvedic techniques like Panchakarma or the detox therapy, Abhyanga or the skill of Ayurvedic massaging using Ayurvedic oils and much more. With its warming and stimulating properties, Cassia essential oil has been used in Ayurvedic healing for increasing pitta dosha and decreasing kapha and vata dosha. Cassia oil has been used in the treatment of depression. This is mainly attributed to the presence of its constituent known as Cinnamaldehyde, which helps in uplifting the mood, inducing positive thoughts and combating depression. It helps in relieving one from negative feelings. Ayurveda recommends Cassia oil especially during meditation, yoga and Pranayama for supporting the perfect harmony of the mind, body and the soul. Adding 2 drops of this oil in vaporizer, burner or diffuser particularly during prayers, meditation, Pranayama or the art of balanced breathing and yoga practices can help in augmenting mental clarity, boost self-confidence, enhance memory skills and to face the challenges of life with original sense of improved independence. A 2011 study proved that an isolated substance (CEppt) in the cinnamon plant that inhibits development of Alzheimer’s disease in mice. CEppt, an extract of the cinnamon bark, was used to resolve the mouse model of Alzheimer’s disease. It is also said that Alzheimer’s disease is a form of brain diabetes and is also explored that there is a connection between Type 2 diabetes and Alzheimer’s disease. This is because “Insulin and insulin receptors in your brain are crucial for learning and memory, and it’s known that these components are lower in people with Alzheimer’s disease”, says Donald Graves, professor in UCSB’s Department of Molecular, Cellular, and Developmental Biology. Cassia cinnamon proves effective in treating Alzheimer’s disease mainly with its potent to control blood glucose level in patients with Type 2 diabetes. Diabetes is one among the most common health condition that about 60% of the earth’s population battles everyday and it is often regarded as a bane to humanity. Treatment of diabetes through Allopathic medicine has not gone a very long way. Studies show that Cassia oil can be used in the treatment of diabetes especially in type2 diabetes where patients suffer with malfunctioning of insulin in the body. Cinnamon oil helps lower the level of blood glucose in people with type 2 diabetes; this is made possible through the abundant presence of a Polyphenol compound in Cinnamon that is soluble in water. A 2003 study published in the Diabetes Care journal states that Cassia Cinnamon helped in reducing blood glucose levels, a blood lipid known as triglycerides and bad cholesterol levels (LDL). Relax your system by adding 2 drops of Cassia oil to warm bathing water in the morning and you can also add 1 drop of this oil to your handkerchief and stay refreshed throughout the day. In addition to that you can invigorate yourself by an Ayurvedic massage in the weekend with 5 drops of Cassia oil blended with 5 drops of Nutmeg oil, 5 drops of Fennel oil and 10 ml of coconut oil, followed by a warm bath can aid in controlling your blood glucose levels and bad cholesterol levels by penetrating through the skin and passing commands to the bloodstream. Rheumatism is an auto-immune disorder that occurs mainly due to the buildup of toxins or ama in the body caused due to the inequality of digestive fire in the body. Ayurveda states that ama or the toxic substances in the body has the hazardous power to obstruct the functions of the vital organs in the system. These substances reach the kapha subjugated parts of the body including joints, chest, stomach, fingers, brain and certain other parts. The symptoms being improper blood circulation, swelling of joints, inflammation, loss of energy, fatigue, inflammation, insomnia, burning and itchy eyes, indigestion, redness, morning stiffness and much more. Being a circulatory, anti-rheumatic, analgesic oil and controller of excess kapha dosha proves Cassia as an excellent natural remedy for treating rheumatism, arthritis and its associated symptoms. Massaging the affected parts with 2 drops of Cassia oil mixed with 2 drops of Cardamom oil, 2 drops of Nutmeg oil and 3 ml of sesame oil can help in enhancing blood circulation, augmenting warmth feelings to the joints, alleviating pain, reducing inflammation, promoting frequent urination through which toxins are eliminated and relieving from other related symptoms as well. The carminative and stomachic properties of Cassia oil help in treating gastro-intestinal problems and other digestive problems including gas, indigestion, diarrhea, flatulence, nausea, vomiting, and infections in the stomach and intestines. For treating digestive problems, you can massage your abdomen with 2 drops of Cassia oil mixed with 2 drops of Nutmeg oil along with 2 ml of avocado oil. Respiratory infections like cold, cough, influenza and congestion occur due to vitiated kapha dosha causing excess fluid deposits leading to accumulation of phlegm, mucus and other microbes in the nasal, respiratory and bronchial passages. Cassia essential oil has anti-microbial, anti-viral and expectorant properties along with its potent to regularize the functions of kapha dosha. Adding 2 drops of Cassia oil in steam inhalation along with a gentle massaging of your throat, chest and back with 1 drop of this oil mixed with your vaporizing ointment can grant quicker relief from all kinds of respiratory problems. You can also practice Pranayama (Ayurvedic breathing exercises) for relieving from chronic respiratory problems like asthma, bronchitis etc. 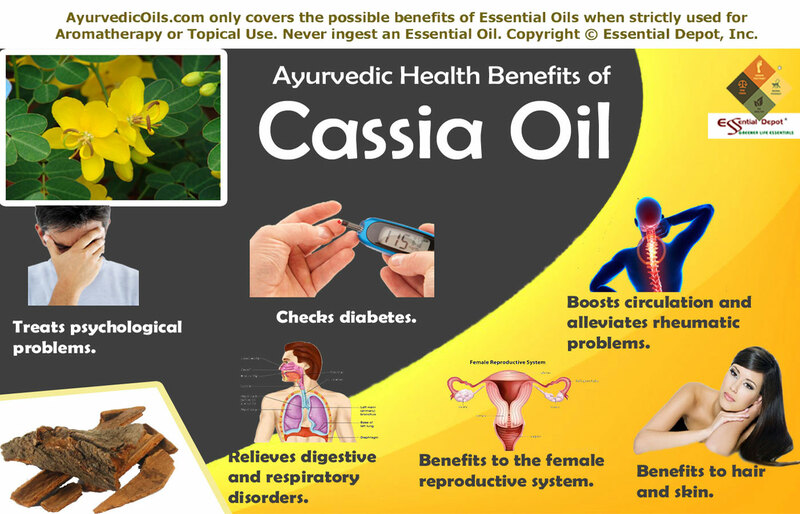 Cassia oil is a proven natural medicine for treating menstrual pain, spasms, irregular periods, and blocked menstruation. This oil has emmenagogue properties that induce menses and is a boon to women suffering from blocked or irregular menstruation. The analgesic or pain-relieving properties of Cassia oil help in reducing menstrual pain or dysmennorhea. Massaging your lower abdomen and thighs with 2 drops of Cassia oil mixed with 1 ml of sesame oil can help in alleviating painful menstruation, delayed periods and menstrual spasms. Adding 2 drops of this oil in warm bathing water can help in reducing anxiety, fatigue, nausea, restlessness and loss of energy associated with menstruation. Cassia and its oil have been used since the ancient Chinese tradition for preventing childbirth and for controlling milk in breastfeeding mothers with its anti-galactogogue properties. Cassia oil finds its uses in cosmetic and hair care products as well. When used with Chamomile tea, Cassia oil can act as a hair dye, and when mixed with lemon juice in right proportions it gives a good strawberry blonde hue for your hair. Shampoos and conditioners that contain Cassia oil can help in the nourishment of your hair from within. Cassia obovata when made into a mixture with hot water can be used as a hair mask. Adding 2 drops of Cassia oil to 10 ml of your mild shampoo can help in fostering hair growth, treating damaged hair, strengthening hair follicles and aid in retaining the natural moisture in the scalp. When it comes to skin care, powdered Cassia and its essential oil are used since the primeval times for treating a wide range of skin problems including acne. This oil works well as an anti-viral and anti-fungal agent and highly helps in treating fungal and viral infections of the skin. Mixing 2 drops of Cassia oil with 1 drop of Orange oil and 1.5 ml of olive oil and applying it gently on the affected parts can assist in treating pimples, blackheads, ringworm, athlete’s foot, itching, wounds and other skin infections. Massaging your facial skin with this blend can also help in eliminating dead skin cells and controlling excessive secretion of oil causing acne. Cassia also finds its use as anti-emetic oil by preventing nauseating sensations and also relieves one from vomiting. You can wear 1 drop of Cassia oil on your wrist or add it to your handkerchief or a tissue and inhale the medicated aroma to help you prevent from vomiting and enhance your appetite, especially during travelling. Cassia oil seems to speed up the functioning of the kidneys and is also known for affecting the libido due to its aphrodisiac qualities. In food, Cassia oil is used for its wonderful aroma and its sweet flavor that gives the dish an additional taste. The delicate scent of Cassia essential oil plays a major role in reducing drowsiness, irritability, pain, frequency of headaches, and more. So adding 1 to 2 drops of this oil to your diffuser or air freshener and inhaling the light scent of this oil in your room can gift you an amusing atmosphere. Cassia oil also helps in relaxing tight muscles and spasms. This article is completely for the purpose of information and education. It is not meant to cure, diagnose or put a stop to any medical condition or substitute any prescription medicines or expert medical advice. We are not medical professionals and this information is published only with the concern of sharing the conventional principles and therapeutic uses of Ayurveda, the oldest of all healing sciences in the universe. Do not take essential oils internally and always keep in mind that you dilute essential oils before using it for topical application. This is because organic and pure essential oils are greatly concentrated liquids and may cause allergic reactions if used on the skin directly. Make certain that you consult your Ayurvedic expert/healthcare practitioner prior to choosing the right essential oil for your unique individual constitution and medical condition. Avoid Cassia oil if you are pregnant or nursing your baby. The MSDS (Material Safety Data Sheet) of Cassia oil is readily available for your enhanced safety and better usage. 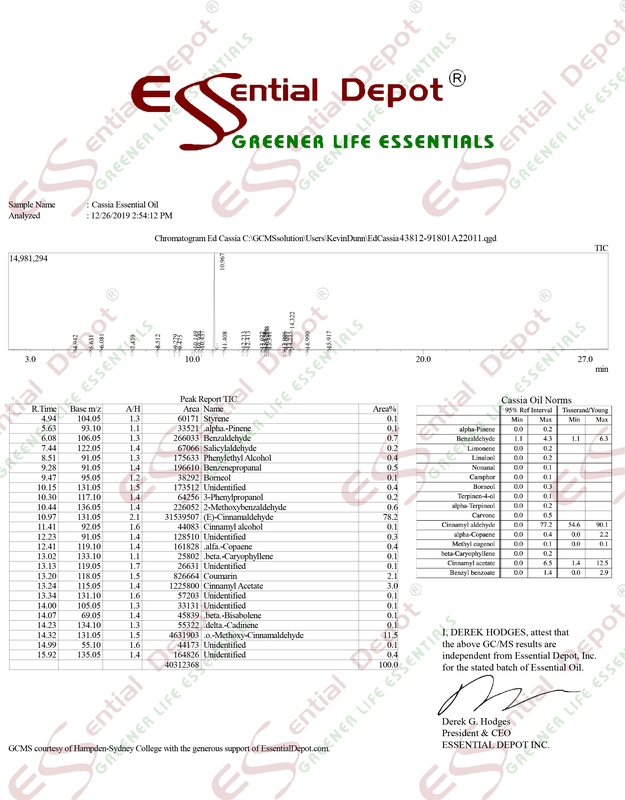 Gas Chromatography Report (GC analysis) of Cassia oil. It may provoke debility, itching, irritation, insomnia, and depression in some people. This mainly occurs when the use of Cinnamaldehyde exceeds the maximum safe level of usage. The highest recommended level by the International Fragrance Association (IFRA) for Cinnamaldehyde is 0.05% for most of the products. When used in vapor therapy and topical application beyond the recommended usage level, Cinnamaldehyde, cinnamyl acetate, cinnamic acid and cinnamyl alcohol are said to contribute to the irritation of mucous membrane and are accounted for hepatotoxicity (toxic, irritant and might cause damage to the liver), mutagenic (alteration in the structure of DNA), reproductive toxicity (research supporting significant fall in the number of nuclei and changes in the allotment of embryos in pregnant mice) and restrain platelet aggregation, a vital part of the blotting clotting process. Undiluted or concentrated Cassia oil have been proved to cause severe irritation in rabbits in certain studies and few other studies involving consecutive patients with dermatitis, few people were sensitive to 2% Cassia oil on patch testing. This entry was posted in Essential Oils - Learn About and Purchase and tagged Ayurvedic health benefits of cassia essential oil, Ayurvedic oils for Alzheimer's disease, Ayurvedic oils for candida, Ayurvedic oils for cold, Ayurvedic oils for delayed menstruation, Ayurvedic oils for depression, Ayurvedic oils for diabetes, Ayurvedic oils for digestive problems, Ayurvedic oils for insomnia, Ayurvedic oils for loss of libido, Ayurvedic oils for menstrual pain, Ayurvedic oils for menstrual problems, Ayurvedic oils for microbial infections, Ayurvedic oils for nausea, Ayurvedic oils for proper blood circulation, Ayurvedic oils for respiratory infections, Ayurvedic oils for rheumatism, Ayurvedic remedies for irregular periods, Ayurvedic remedies for type2 diabetes, Cassia essential oil, Cassia in Ayurveda, Chemical constituents of Cassia Oil, Cinnamomum cassia, Gas Chromatography report of Cassia oil, Greener life Diamond Bio-Healthy Score of Cassia oil, Health benefits of Cassia oil, MSDS report of Cassia oil, Possible skin issues of Cassia oil, Safety data sheet of Cassia oil, Therapeutic properties of Cassia Oil by AyurvedicOils. Bookmark the permalink.